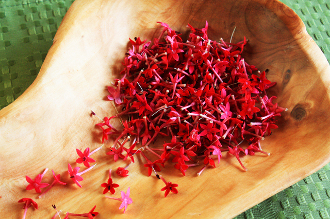 Micro sized, 5-petaled red and pink flowers shaped like stars. Mild, sweet flavor. Add a spark of color to green salads. It's tiny size and delicate look make it a classy garnish for canapes. Of course a gorgeous garnish for plated desserts, this versatile flower can even be a great float on a cocktail.